India is a leading player in the edible oil industry, being the world’s largest importer from Indonesia and Malaysia and third largest consumer. India is the fourth largest oil seed-producing country in the world after USA, China and Brazil. Edible oils constitute an important component of food expenditure in Indian households. Although 40% of the market is fragmented and unbranded, there is a growing demand for branded edible oils. Hygiene concerns, awareness and preference for healthy, fortified variants, and increased income levels are pushing up the market for branded cooking oil. As an edible oil manufacturer, it’s vital to upgrade to advanced edible oil filling & packaging machines to pack these viscous products in various flexible pouch formats that will entice & attract your target audience. Metal tins, glass bottles and cans are giving way to flexible pouches that are light-weight, cost-effective and safe – preserving the nutrient value of the oil. Flexible pouches also offer superior retail value as they are easier to transport, occupy less space and look better on retail shelves. The Indian edible oil market is evolving every day. Refined oils are being replaced by healthier options like olive oil, canola oil and refined rice bran oil. Olive oil which was earlier used for personal care purpose has gained a foothold in the premium segment Indian edible oil market. Also there has been a rise in demand for newer categories of oils like palm oil, soya bean oil, gingerly and mustard oil. Manufacturers have therefore started concentrating on the new trend and demand while choosing contemporary cooking oil packaging machines. Healthy, fortified oils are also gaining a foothold in this competitive market. Oils with vital vitamin content viz. A, D & E, to help fight malnutrition, low fat & cholesterol oils which enable consumers to stay light and active is today a major trend in this industry. Also buying edible oil in smaller quantities is another major trend. Whereas sectors like hospitality do purchase 15 litre bulk-pack tins, general households purchase oil in 1 liter and 2 liter oil pouches and 5 liter cans. For edible oil packing, Nichrome is the preferred supplier of oil pouch packing machines. As a renowned Oil Packing Machine Manufacturer, Nichrome is trusted for its innovative cooking oil filling machines and ghee pouch packing machines.Nichrome’s Automatic Oil Filling Machine, FILPACK SERVO SMD is a high speed, accurate and hygienic oil packaging machine designed to deliver an impressive 100 packs/min. in 50 ml to 100 ml, 3-side seal pouch formats. It promises to protect the purity of the product, improve time-to-market, and enhance the retail value of the brand. The VFFS edible oil filling machine is built with an enclosed SS cabinet construction. UV sterilization of the packaging film is inbuilt. The automatic filling machine has the capability to pack two different products and quantities at the same time. Space requirements are lessened as the oil filling machine does not have any side opening. The controller is operator friendly and the machine is totally mechanical with no need for compressed air. FILPACK SERVO SMD is a versatile machine that packs more than edible oil and ghee. 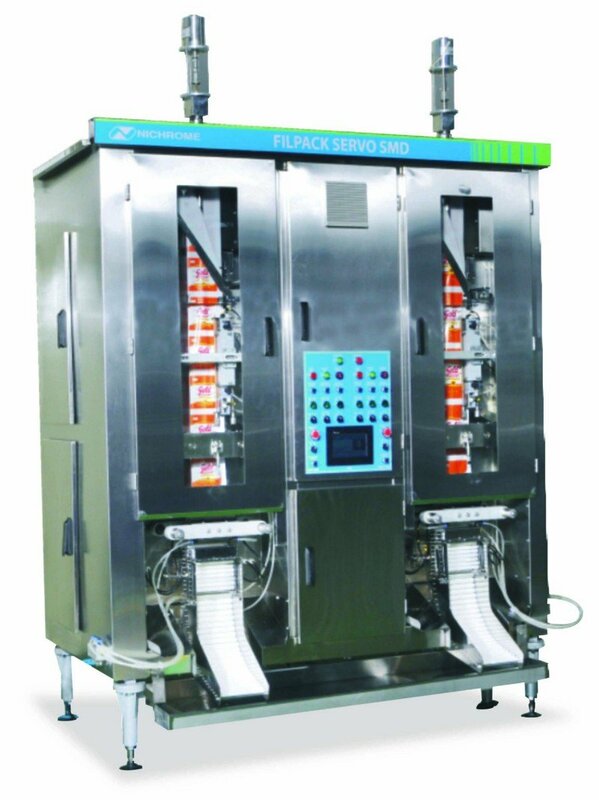 Other viscous products such as Vanaspati, Pasteurised Fruit Pulp, Mango Pulp, Fresh Cream, Tomato Puree, Mayonnaise, Bread Spread, Curry Paste, Lubricating Oil, Grease, Paint & Varnishes can be packed in convenient CSSP packs by this automatic filling machine.